I am sure all of you have had various memorable moments in your lives. I remember when I became a Dr, then a mother and a surgeon. This week, I became an author! I was surprised how much it thrilled me to see my name on the cover of a book. The list of people involved is long. It has been a truly collaborative effort and a huge thank you to everyone. Health workers share responsibility for their own continuing education and professional growth. 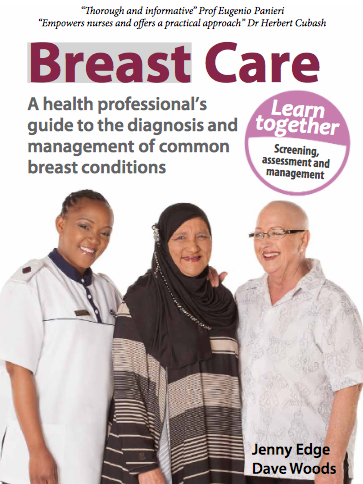 There are a number of books in the series which are published by bettercare and "Breast Care" is the latest addition. Bettercare is a small publishing company run by Arthur and Emma Attwell. They are a division of electric bookworks. 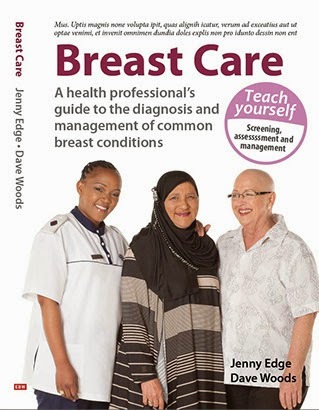 This book is an incredible resource, not only for health care professionals but for people effected by breast cancer. I love the down to earth, practical and direct approach. It includes so much information and is still accessible. Well done Jenny! When I was being discharged, I was quite taken with the on-the-job training which I saw Jenny do in hospital, and I've told a number of friends about it. Reading this blog, it all makes sense. I'd ask a question, Jenny would turn to the nurse and ask what she would suggest, and then directly but gently redirect her thinking if needed. "How fast can I get back to normal?" I asked. "Two weeks" replied the nurse. Jenny: "Well, two weeks would be OK if Susan is a) getting back to walking a Maltese poodle and not a 45kg Dobermann, and if she weren't so inclined to high activity. So to someone like Susan, we say THREE weeks!" Now I see the passion for healthcare education, I see it's simply her way of working.